A computer hacker from the 20th Century has succeeded in erasing the past. Known only as the Hacker, the hacker's target has been to systematically destroy the "tapes" that form the basis of the bible. In an effort to stop the Hacker, several business interests of the 20th Century have channeled into the past and isolated Timothy, bishop of Macedonia, later St. Timothy, and have convinced him to write his version of the Sacred Story. Once written Timothy is to bury the gospel where it will be found in the future and thus ensure the Sacred Story gets told. In addition to beating the Hacker at his own game, the business interests in the form of NBC and its parent company General Electric, plan to perfect their time travel technology to allow them to transport a television crew back to the time of the Crucifixion at Golgotha. A sure fire ratings winner, the network plans to boost its rank in the fall sweeps by broadcasting live from Golgotha. Can the Hacker be stopped? Will Timothy manage to record his version of the gospels before the Hacker's virus infects his time period as well? All this and more is revealed during the course of the book. 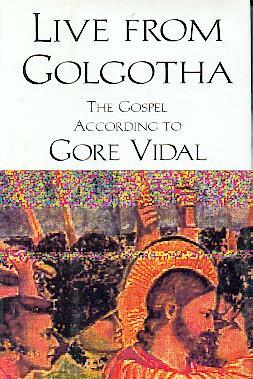 Not having read any of Gore Vidal's previous works, I wasn't sure what I was getting myself into when I picked up a copy of Live from Golgotha. I remember reading a review of it when it first came out in 1992 and the reviewer tried desperately to stir up some controversy regarding the interpretation of the Crucifixion. I found it somewhat difficult to get into the novel, but once immersed in I found myself enjoying the political and religious intrigue that winds its way throughout the novel. Gore Vidal takes a somewhat cynical and satirical view of religion and emphasizes Christianity's objectives as being about the all mighty dollar. Vidal makes references to Saint Paul's Holy Rolodex of names used for fundraising and of Jesus' attempt to lower the Prime Rate as the real reason for Jesus' ousting of the money-lenders from the temple. Vidal includes a host of historical figures as characters in the book such as Saint Paul (a.k.a. Saul of Tarsus, a.k.a. Saint), Saint Peter (a.k.a. The Rock), Saint Timothy, Pontius Pilate,	Emperor Nero, Jesus Christ, and Judas. Not to mention some other contemporary figures such as Oral Roberts, Mary Baker Eddy and Shirley MacLaine. As far as its success as time-travel novel, I would say it accomplishes what it set out to. Vidal paints not one but two plausible methods of traveling to the past or what he calls tapes. One method is the Cuttler Effect, a technology which allows the transmission of images and objects through time & space while the second is the channelling of individuals through mediums into periods occupied by former selves (i.e. past lives). As is key with any science-fiction device, it is important that the writer not spend too much effort explaining the inner workings of their devices, less they open themselves up to disbelief. Giving just enough detail to make it seem plausible Vidal prevents the science-fiction of the novel from overwhelming the narrative of the novel. In my opinion Vidal also manages to subtly avoid any paradoxes while painting a believable alternate history of the events as they unfold. All in all a good read and one that I would recommend, although it may offend some with strong religious views.